In my decade as a games journalist I’ve reviewed nearly 1000 games. Most of these reviews were written during my six years at Official Nintendo Magazine (ONM), and most of these were small ones – indie titles, WiiWare and eShop games, retro Virtual Console releases and the like. But many were also multi-page reviews of triple-A titles. One of the questions I’m most often asked is which of these reviews was my favourite. I have two. 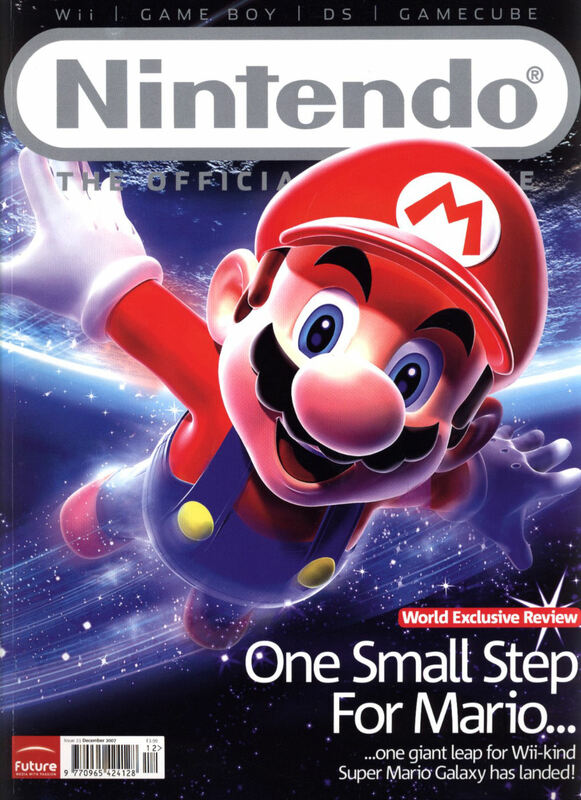 The first is my Super Mario Galaxy review from ONM issue 23 (December 2007) and the second is my Super Mario Galaxy 2 review from ONM issue 56 (June 2010). Another of the questions I’m asked is how to write a review. There’s no easy answer to this – indeed, there’s no answer at all. Every reviewer has a different style, so there’s no right way to do it. What I’ve decided to do, though, is take you through my two favourite reviews and give you a little insight into how they were put together. I’m going to take you on an annotated tour of my Super Mario Galaxy review and my Super Mario Galaxy 2 review. Below you’ll see the full text of both reviews, as they originally appeared in ONM. This is courtesy of my former employer Future Publishing, which has kindly agreed to let me republish them for the purposes of this article. As well as the original text, I’ve also included the original boxouts (the information panels) from each review, just so you can get everything that was originally included. However, at first glance you won’t see any annotations. What you have to do is click this massive link below, and then (all going well) you’ll be taken to an annotation-filled version of the same page. Once you do this, click any of the yellow text you see and an annotation will pop up, explaining the text. It could be a story behind a certain paragraph, a writing tip or what have you. Here’s an example. If that last sentence is yellow, click/tap it and see if you get an annotation. If you do, it works. So then, without further ado, let’s begin. There are some moments in gaming that define why we’re all here right now, moments that explain why we love games so much. They’re the main reasons we chose to be games journalists and the main reasons you’re reading this magazine. These moments are different for each individual gamer; for you it could be that death in Final Fantasy VII, for us it could be scoring directly from a corner in the original International Superstar Soccer. But then there are those that almost universally affect everyone: doing your first loop-the-loop in Sonic The Hedgehog, getting your first Tetris, the first time you swung the Wii Remote playing tennis in Wii Sports, and so forth. It seems appropriate for this review then that the franchise responsible for most of these moments is the Mario series. Everyone who has played their fair share of games can relate to sliding down their first flagpole in Super Mario Bros, finding Yoshi for the first time in Super Mario World, running around Peach’s castle grounds in Super Mario 64 and so on. Now, with Mario’s first proper adventure on Nintendo’s fifth generation console, the plan is to provide some more of these defining moments and revolutionise platforming all over again, as had been done with Super Mario 64 just over a decade ago. Thankfully, we can safely state “mission accomplished”, as Super Mario Galaxy is one of the finest games we’ve ever played. It’s funny, because the thing that annoys us most about Galaxy is that its fantastic graphics show us the sort of games we could have been playing for the past year had some developers bothered to pull their finger out and actually tried to use the Wii to its full potential. Any claims that Nintendo’s console is effectively a motion-sensitive GameCube are blown right out of the water when you start the game and witness the controllable intro sequence. As you make Mario approach Peach’s castle during a night-time meteor party you can’t help but stop and admire the incredible water effects as the light shining through the castle windows reflects on the surrounding lake, while small meteor fragments and stars rain onto the castle grounds. It doesn’t let up there either. Throughout the whole game the graphics constantly amaze, with stunning visual effects (as the camera moves and large planets rise or set far in the distance you’re treated to a fantastic sight as the horizon glows, creating a sort of lens flare effect), some remarkably huge playing areas (if you stop just before you collect the star in one of the Honey Hive Galaxy missions, you can see the whole of the level sprawling down below you) and characters that are positively filled to the brim with personality (not least of all, the main man himself). Simply put, if you’ve long been dreaming of a game that actually makes the most of the Wii’s powerful graphics processor then your dreams have come true. Super Mario Galaxy will not only rock your socks, it will blow your actual feet clean off, leaving you with a set of comedy stumps that you can use to pretend you’re a marauding pirate (not literally mind, Nintendo’s strict health and safety policy wouldn’t allow that). If your ears are starting to feel a little bit jealous, tell them not to worry; the eyes aren’t the only thing being treated to a feast here. The sound is some of the best we’ve heard in a Mario game. While the new musical themes may not immediately be as catchy as the classics we all know and love, they fit the environments perfectly and capture the feeling of being in an unfamiliar location and we promise that eventually you’ll grow to love them all the same and find yourself uncontrollably humming along as you’ve done in previous Mario titles. Some of his power-ups give a similar sense of nostalgia. As well as the all-new Bee Suit and Boo Suit and some other power-ups we don’t want to spoil (let’s just say they involve ice and bouncing), the return of Fire Mario and invincibility (complete with the original music) make it clear that this is a return to Mario’s roots. In fact, strange as it may seem to claim, we reckon that if Super Mario Galaxy shares most with one particular game in the series it’s Super Mario Bros 3. While the fact it’s set in 3D means that obvious comparisons will be drawn to 64 and Sunshine, the fact is that Galaxy calls upon the third game a number of times throughout when it comes to nostalgia trips, something Mario’s previous 3D ventures chose not to do. Bowser arrives at the start of the game in an airship – much like the boss battles in the third game – complete with the same airship theme that played during the original. Similarly, the Cookie Factory Galaxy features the same music as world 1-2 of SMB 3, bringing a smile to the face of anyone who remembers it (it certainly had us grinning like we were 10 years old again). 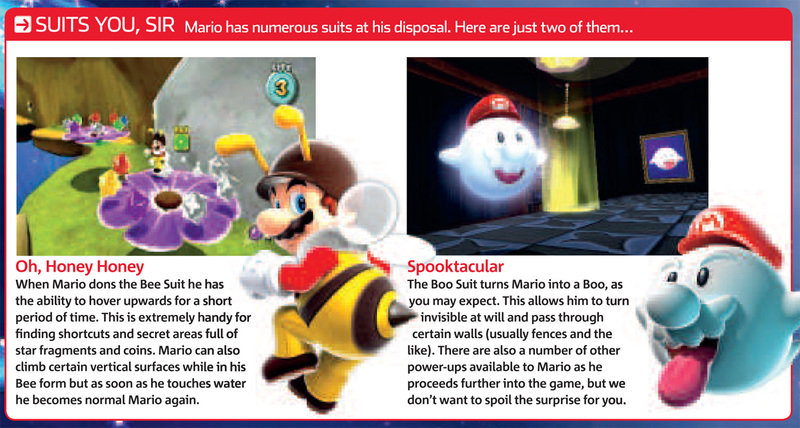 And collecting the likes of the Bee Suit and the Boo Suit for the first time had us reminiscing of the times we first encountered the Raccoon Suit and the Frog Suit in Mario’s third adventure. In terms of difficulty, the game varies. When we originally played demos of the game we were worried that it was going to be too easy, but those fears can be put to rest. While some missions are indeed quite simple, others will test the skills of even the most dedicated Mario fans (the aforementioned Cookie Factory Galaxy has a nice stage where you have to make your way along moving platforms riddled with holes by carefully jumping forward, avoiding the holes and being sure not to hit any laser beams in the process). It’s perhaps slightly trickier than Super Mario 64, but not as frustrating as some of Super Mario Sunshine’s later levels were. Challenging but entertaining, in other words. Needless to say it’ll take you a while to get all 120 stars. Playing with the Wii Remote as a pointer sounds like it might be a fiddly experience but the fact is that within five minutes we’d actually forgotten that we were using it. It speaks volumes about how well the system works (you can stun enemies by pointing at them and pressing the B button to fire star fragments at them, and can gather a load of star fragments by simply waving the pointer over them) that within mere minutes it felt like we’d been doing this since the days of Mario 64. 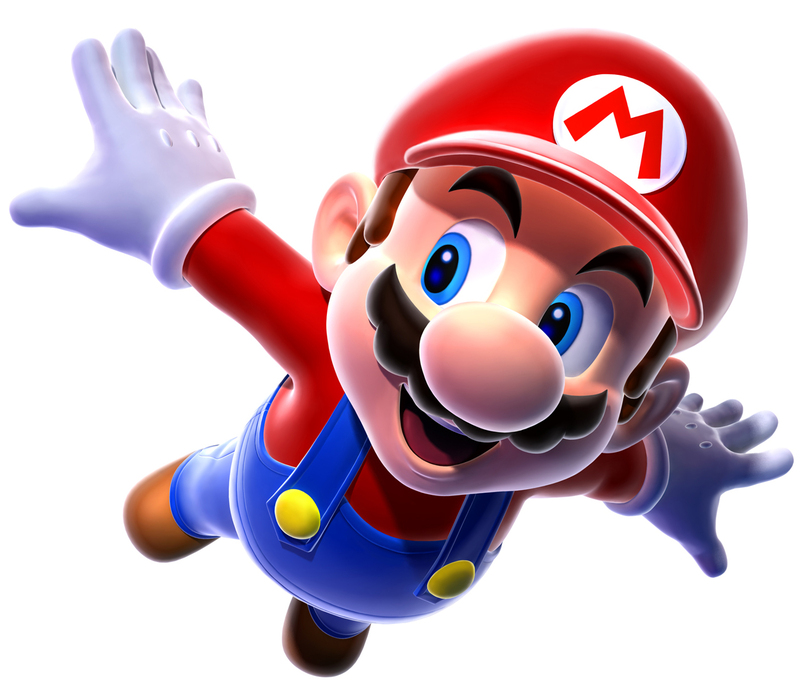 The ability to make a second player control the pointer instead to let you concentrate on controlling Mario feels slightly tacked-on but at least it offers some form of co-operative gameplay for the first time in a 3D Mario adventure (even if the player controlling the pointer is clearly getting the short straw). To tell you any more about Super Mario Galaxy would be like giving you a packet of Maltesers that we’d already sucked the chocolate off of. We know that the vast majority of you are going to buy this, so telling you all our favourite bits would just be a case of rubbing it in because we’ve experienced them first. If we bought a ticket for a film at the cinema we’d hate someone to spill the beans on the showstopping set-pieces before we’d seen them for ourselves. There are so many moments in this game that had us gasping with surprise, chuckling away at cheeky nods to past games and shaking our heads at the sheer genius of it all that it’d be a crime to gaming if you didn’t experience it for yourself. 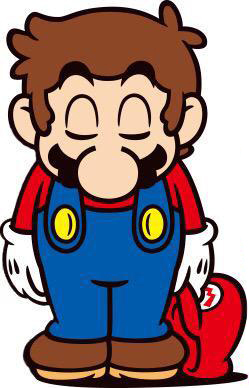 Super Mario Galaxy comes out in Japan two weeks before the UK gets it, and in America four days before. Do yourselves a favour and avoid all gaming websites if possible for that period of time (except ours, mind!). 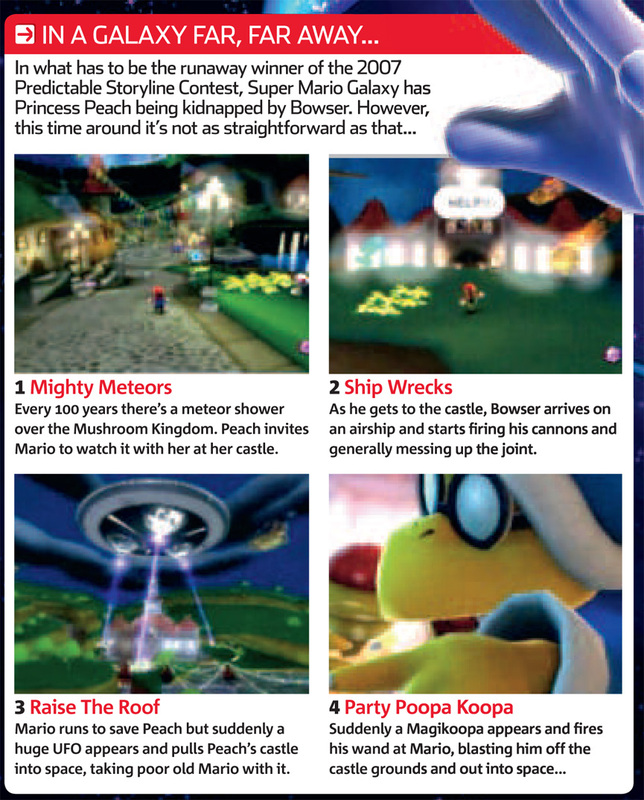 Games like this are designed to surprise, amaze and entertain and we’re happy to state that Super Mario Galaxy does all three more effectively than the vast majority of games we’ve played over the years. They’ve done it. Miyamoto and his team have managed to take the tired platforming genre and turn it into something magical all over again. If you have a Wii, buy this. Simple. It seemed like an impossible mission. After all, when you release a game that’s generally praised as the best on the Wii, a game that’s had countless near-perfect scores from the world’s reviewers, how could you possibly hope to improve on that? This was the challenge faced by Shigeru Miyamoto and his team and it’s a challenge that, incredibly, they may have actually managed to overcome with Super Mario Galaxy 2. First of all, let’s set one thing straight. If you haven’t played the original Galaxy yet then it’s essential, both in terms of reading this review (since we’ll be referencing stuff from the original) and playing the sequel. The difficulty is ramped up so highly in Galaxy 2 that if you aren’t used to the way the game’s gravity mechanics work you’re going to be in trouble. It’s certainly not because of the plot. Stories in Mario games are wafer-thin at the best of times and Galaxy 2’s is no exception. If you were wondering how the game was going to follow on from the original’s bizarre ending, the simple answer is that it doesn’t. Instead, Galaxy 2 takes place in a Star Trek-style alternate universe, one in which Mario and the Lumas have never crossed paths before. The original game’s intro was beautifully presented and this one is arguably better, as you play through sidescrolling levels drawn into a storybook. As you progress, the pages turn while the story appears at the bottom of the screen. It’s lovely stuff. Naturally, the plot involves Bowser kidnapping Peach (see the ‘A Tale Of Two Galaxies’ panel), so don’t expect to see it in Richard & Judy’s Book Club any time soon, but it’s a decent enough intro and it gets you into the action much quicker than the previous game did with its unskippable cut-scenes. Early on you’re greeted with the game’s first big(ish) addition, Starship Mario. This is an old planet that has been taken over by an industrious Luma called Lubba and converted into a spaceship. The ship needs Power Stars for fuel but Bowser nicked those along with Peach, so Mario agrees to help Lubba retrieve the Power Stars from the various galaxies in return for the use of his spaceship. Lubba then gives the planet a quick makeover so it looks like Mario (leading to the classic line “nice spaceship, huh? More like a FACEship!”), and that’s the story of the big Mario-shaped planet, otherwise known as Starship Mario. Starship Mario is a sort of mini-hub. It’s not a true hub like Peach’s Castle, Delfino Plaza and the Comet Observatory from previous 3D Mario games because you can’t directly access levels from it. Instead, you simply use it to wander around, mess about and generally take a break. There’s not really much to do on Starship Mario except for talk to the various people you’ve already encountered on your travels, who appear on board the ship as you play through the game. You can’t actually choose which galaxy to visit directly from the hub. Instead, moving to the ship’s wheel calls up a map screen similar to that in New Super Mario Bros, where you choose which level to move to next. Some paths are blocked off until you collect a certain number of stars, and the Hungry Lumas from the first game return to unlock secret paths (i.e. galaxies) if you feed them a certain number of Star Bits. Whether this new style of galaxy selection is a good or bad thing is purely down to personal opinion. We liked it because it let us play through the game with a lot less hassle. It’s a much clearer way of showing which galaxies still need to be completed and doesn’t get confusing like the Comet Observatory did towards the end of the original game. Anyway, enough babble about the hub. The game’s main meat is obviously the actual levels, and this is where Galaxy 2 really shines. It’s clear that Miyamoto and his team have just gone crazy this time and have been given free reign over their level designs, and the results are fantastic. You’ll be doing even more weird and wonderful things this time around than you did in the previous game, from using Cloud Mario to make platforms that help you climb a mountain, to gliding through a rainforest while holding on to a giant bird, to solving huge picture puzzles by ground-pounding their sides. The game also feels a lot brighter than the original, since there are far fewer levels with a simple, black, star-filled sky. There are loads more stages that take place in sunny locations, snowy settings, forests and in the sky, and it adds a lot of variety to the game’s levels. Every single one of the game’s 40-plus galaxies offer a completely new gameplay mechanic, and most of them offer even more than that as each galaxy’s individual star missions are unique levels. Take the brilliant Tall Trunk Galaxy, for example. 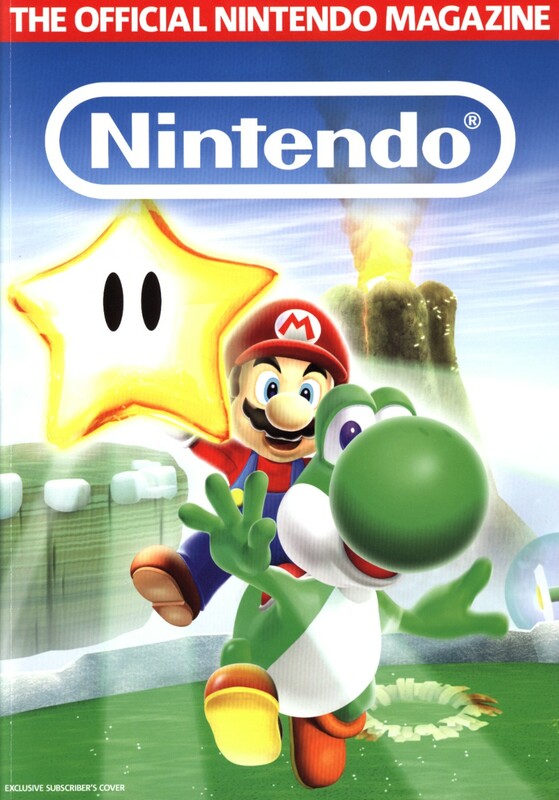 The first star is a Yoshi level where you use the Bulb Berry to get Mario and his mate to the top of a giant tree. The second, however, is a huge slide down one of the tree’s branches, inspired by the Princess’ Secret Slide level from Super Mario 64 (complete with the same music). It may fall under one galaxy, but the two levels couldn’t be more different. Speaking of the music, this is another instance where the game has outdone itself. If you thought the music in the original game was fantastic, wait until you hear some of the stuff included here. Some of the better themes from the first Super Mario Galaxy are back (with new arrangements for the most part), alongside a huge collection of brand new music. These include new orchestral versions of old Mario songs and some fantastic all-new themes. The music in the Fluffy Bluff Galaxy in World 1 will work your way into your brain in the same way Gusty Garden Galaxy’s music did in the first game, but our favourite track by far is the map music in World 3, which is just beautiful. Keep an ear out for it and tell us it’s not amazing. 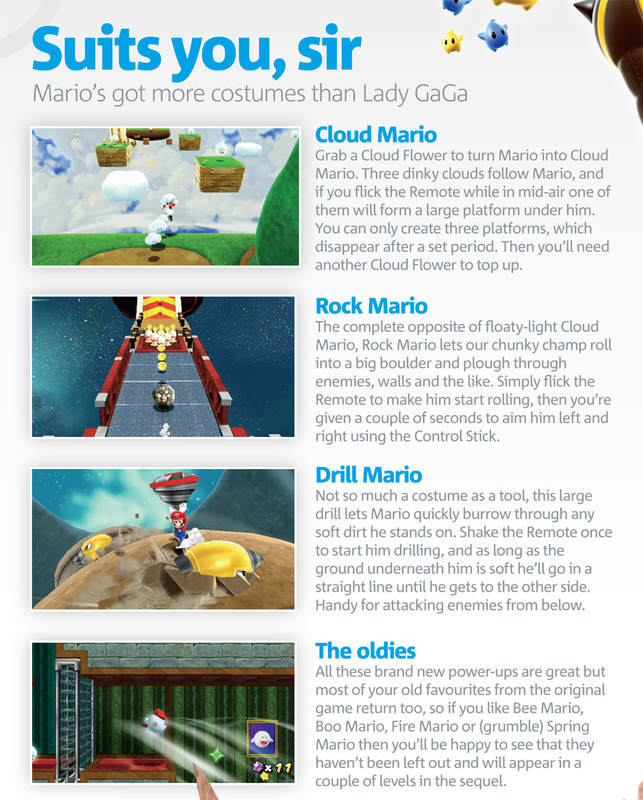 The three big gameplay additions are, of course, Yoshi, Rock Mario and Cloud Mario. Yoshi is once again limited to a certain number of set levels (as he was in New Super Mario Bros. Wii) but he appears an awful lot more than he did in the 2D game, getting a slice of the action at least a few times in each World. 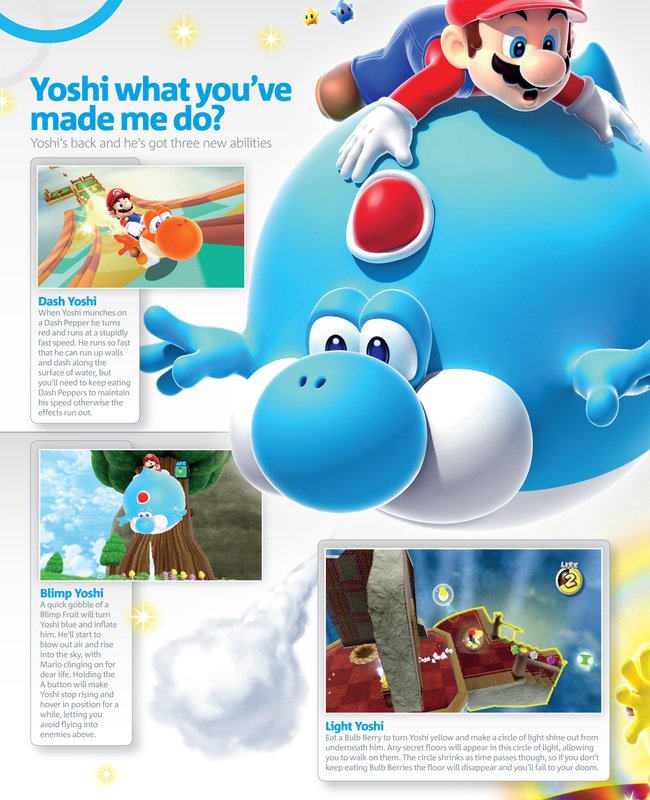 He’s armed with his own set of timed power-ups (see the ‘Yoshi What You’ve Made Me Do?’ panel), each of which help to make his levels feel unique. Controlling him is an absolute joy, and the ability to simply point at the enemies and items you want him to eat and press the B trigger to stick his tongue out is really simple and satisfying. Also surprisingly fun is the Rock Mushroom power-up, which turns Mario into Rock Mario. A quick flick of the Remote makes Mario roll up into a ball, at which point he blasts across the ground, leaving you to control him as he rolls by turning him left and right, ploughing him through enemies and breakable objects. It could have been the new Spring Mario (which thankfully only shows its frustrating face once or twice this time around) but instead strikes just the right balance between manic and controllable. Then there’s Cloud Mario, who has the ability to make up to three huge cloud platforms appear underneath him when you flick the Remote in mid-air. This is by far our favourite power-up because not only does it work perfectly, giving you a lot more freedom to explore the levels it features in, but the faces on the clouds are just too cute to hate. The game constantly chucks new additions and improvements at you as if it was the done thing to do. Luigi nonchalantly turns up about 20 stars in and offers his services at random points throughout the game, which is a good thing because it means you don’t have to get all 120 stars to play as him this time. What’s the reward for doing so this time around? Come on, we’re not telling you that! A cheeky new monkey simply called The Chimp regularly challenges you to points-based mini-games, where you have to jump on enemies’ heads or play whack-a-mole style skating levels (these are much better and trickier than they sound, don’t worry). Previous gimmicks from the original game, such as the big Star Ball you tilt the Remote to steer, suddenly emerge for a single level and then leave again. There’s just so much going on that not once does the game ever feel repetitive. We’ve said before that Miyamoto and his team chuck into single levels ideas that other companies would focus whole games on, and that’s never been truer here. We’ve played whole racing games that are worse than the gliding levels, where you have to help a tropical bird carry Mario to the end of a level before his opponents, and the Cloud Mario mechanic could easily make a game on its own. Then there’s the new emphasis on 2D. There are loads of levels (or parts of levels) where the action switches to a fixed 2D plane, and moving up and down on the Control Stick does nothing. It’s Galaxy’s take on New Super Mario Bros. and we love it, especially on the levels that mess around with the gravity and have you running up walls. Also greatly improved is the game’s two-player co-op mode, this time nicely dubbed Co-Star. Instead of simply controlling a pointer as in the first game, this time player two gets to tell an orange Luma where to go. It’s a bit like a point-and-click adventure game. It allows for a lot more interaction, as your partner can make the Luma attack enemies, collect items and even fetch air bubbles for Mario underwater. Then there’s the Cosmic Guide, the new version of New Super Mario Bros’ Super Guide feature. If you die multiple times on a level or spend a long time umming and aahing, a shadowy figure who looks like Rosalina appears and asks if you need a hand. If you agree she possesses Mario and directs him to the star. There’s a catch, naturally, in that if you get the star like this it’ll only be a bronze one instead of the usual gold one, a reminder that you needed help to finish the game. There’s just so much in this game that we could fill a magazine telling you about it all. However, as was the case with our review of the first game, we refuse to spill all the beans because that would be incredibly cruel. This game is best enjoyed with no knowledge of what’s coming next. Each galaxy should come as a surprise and we urge you to avoid the various spoilers that will undoubtedly end up online in the couple of weeks between the US and UK release. There are loads of surprises and throwbacks to previous games and some galaxies near the end of the game that long-time Mario fans will truly adore, and you owe it to yourself to avoid having the surprise ruined. If you’re the sort who gets their gaming news online, stick to our website for a few weeks because American ones will spoil everything as soon as it’s out there. Super Mario Galaxy’s only real downfall is that, since its basic idea is so similar to its predecessor, it doesn’t hit you with that same initial impact. You were already wowed with orchestral music, gravity-bending gameplay and perfectly immersive pointer controls when you played the original game the last time around, so the surprise isn’t so great here when you’re once again introduced to the same concepts. That’s not to say the game’s a complete retread, of course. Yoshi, Rock Mario and Cloud Mario offer a welcome change and help expand the gameplay even further than before – it’s just that they’re still only cherries on a cake you’ve already had a taste of in the past. 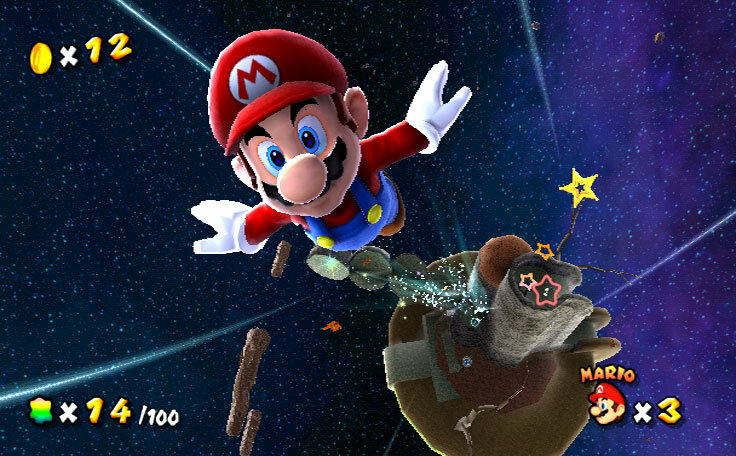 The jump from Super Mario 64 to Super Mario Sunshine was memorable, the following jump to Galaxy even moreso. This time, there’s no real jump; more a slight improvement. It’s understandable, though: when you’ve already made it to the top of a mountain, it’s near-impossible to go any higher, other than putting on a pair of bigger shoes. By creating something that was close to perfection last time, all Miyamoto and his team could really hope to do this time around was inch it ever so slightly closer, and so this sequel is more a pair of high heels on the top of a mountain. If you get what we mean. This is minor nitpicking, though. Our main criticism in our verdict box when we reviewed the original game was that it “had to end eventually”. This sequel goes some way to making up for that by essentially giving you an all-new game just as big – if not bigger – than the original with even more to see and do. This is clearly no bad thing. When you consider that many (including us) feel the first Galaxy is the best game on Wii, a second game offering just as much would clearly slide right alongside it at the top of everyone’s list of favourites, and that’s very much the case here. Is Super Mario Galaxy 2 even better than its predecessor, though? Technically, yes. The levels have been designed better, the game’s structure is more solid and less confusing, and the addition of a few new abilities and loads of new characters manages to pack even more variety into a game that was already full to bursting with it. What’s more, the increased difficulty and wider variety of galaxies should see you taking longer than before to get every star this time, and in the process you’ll fall in love with Mario all over again, to the extent that it doesn’t really matter that it’s essentially the same shell with brand new levels. They say familiarity breeds contempt; the more something stays the same the less you end up enjoying it. Super Mario Galaxy 2 is one occasion where we can happily say the opposite. As long as you finished the original and can cope with the higher difficulty, this is undoubtedly the new best game on the Wii. If you loved Galaxy you’ll adore this. Yet another dazzling high-water mark in Mario’s career. So there you have it. My two favourite reviews ever, along with a whole bunch of notes that hopefully let you in on some of the behind-the-scenes goings-on involved in them. If you have any more questions or would like to see me do this sort of thing again in the future, please do let me know in the comments below. And speaking of the future, my thanks to Future Publishing for letting me republish both these articles in their entirety. If you want to show your appreciation, head to My Favourite Magazines and subscribe to one of its mags. Finally, if you want to support my writing and help make sure more unique articles like this continue to happen, please do consider contributing to my Patreon and helping me continue to write articles which are ad-free, all on one page and (hopefully) entertaining. It was still good, but it’s nowhere near my list of top ten favourite games ever. Top ten soundtracks ever, though? Now we’re talking. I’m playing Galaxy 1 and 2 intermittently at the moment and I must say that they have both jumped to the top of my favourite games list (sorry Shenmue!). I’ve not even completed either of them, but they are (as you say) stripped back fun. There are PARTS of levels that are better than standalone titles. 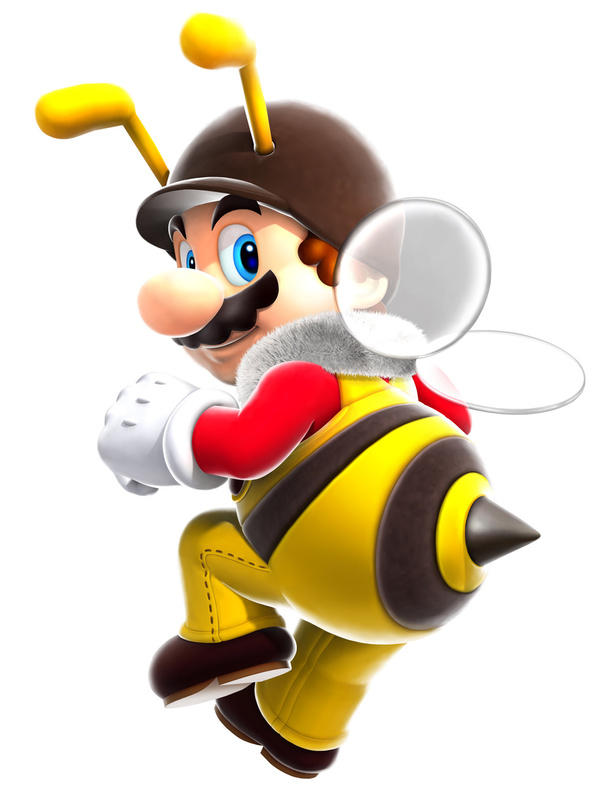 Bee Mario gives us hope for a Buck Bumble 2 one day. The two games are hard to separate – 1 has the hub that gradually unlocks and gives a greater sense of accomplishment, while 2 is a more streamlined experience allowing the player to jump straight to the levels. Or as my daughter says, 1 has Elsa in and 2 has Yoshi. They are both phenomenal experiences that make 64 look primitive and empty, and Sunshine suddenly feels slippery and un-Mario. I never had a Wii when these games were released, but playing in 2016, they truly do deserve the 97% scores as they are classics that will stand the test of time. 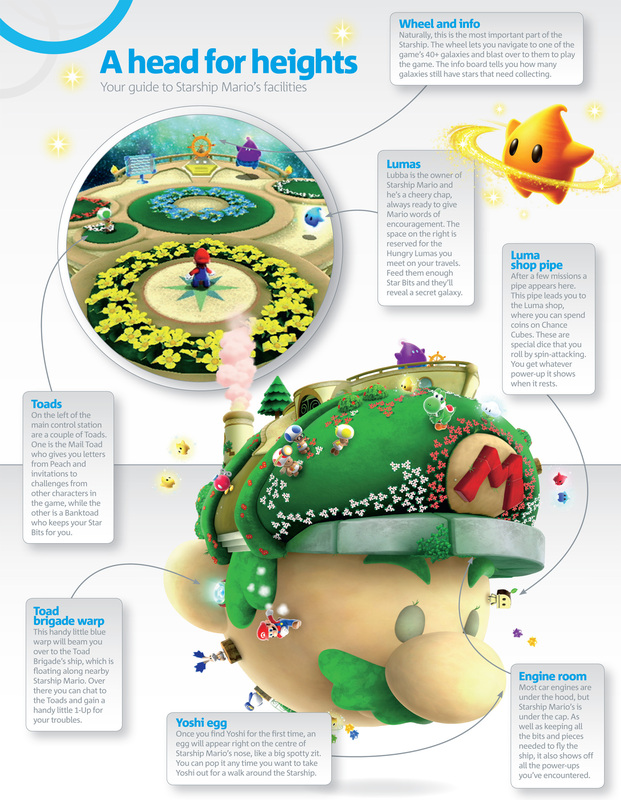 My one quibble is the controls, as while they do feel natural and quickly become second-nature, they can be awkward for young children, and stuff like the “point at the blue stars to win the race against Ghost Boo” mean that it will be difficult to port to future devices without Wii remote compatibility. Yeah, I remember when games magazines used to always say “we” rather than “I” and was slightly taken aback (slightly) later in life, when I moved onto games websites and found writers expressing their thoughts as individuals rather than as a collective. I never minded it though, it gave the impression that the whole team had got together, discussed the game’s potentially divisive points and formed a decisive conclusion. Also, I liked this Genius thing, but why is it “not allowed” on the normal, default version of the page? That’s odd, it should be. The link I give goes to a version that filters it so you only get my annotations, but if you remove the “?filter=annotator:ChrisScullion” from the end of the URL you should get a version you can annotate too. If it doesn’t work I don’t know what to tell you – yuo may have to register at genius.com first. Nah mate, it works fine. What I meant was, once you click the link to activate the Genius version, you can’t put comments in the “normal” comments section (here) – you have to go back. It’s no big deal though. btw That ONM scoring… That was a revelation! Ah, I get you now. That’s because it puts “genius.it/” before everything, including links. It messes up the Patreon link too, annoyingly. As someone who was a longtime reader of ONM, this was some “man behind the curtain” stuff here. Like opening the Ark of the Covenant minus my face melting off. It was really interesting to see some of the behind the scenes stuff; my teenage self would’ve lost his mind if he could see all of this. The revelation concerning the “no 100% score” was particularly mind-blowing, and I think I got some new tips and hints on how to improve my own writing. I certainly wouldn’t mind seeing more articles like this (so long as it’s possible to get approval from ONM or whichever mags/sites you’ve worked for). What I found most surprising was the amount of thought that you put in to pre-empting public opinion, (mis)-interpretation, and so on. There’s bits (like the dig at third-party devs) that I would never have spotted the significance of, which kinda helps me understand why people continue to accuse that kind of thing (even though I don’t agree).